When we saw the range of puffy paint on offer, we were itching to try it on card making projects, upcycling crafts and so much more. The white puffy paint is perfect for creating the look of snow on your Christmas makes. It adds a wonderful, festive edge in a matter of seconds! Simply apply heat and watch your puffy paint design come to life! It’s not always easy thinking of unique Christmas card ideas for your loved ones but with such an easy technique, you’ll be able to whip together a batch of Christmassy makes in no time! 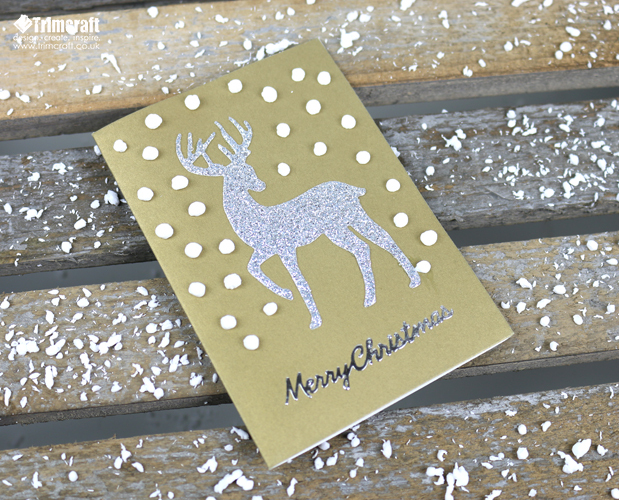 Claire has also adorned her card with a glittered reindeer die cut and a sticker sentiment to make her craft really sparkle. This fun collection of puffy paints will be brilliant to use with the kids for their cute crafts too. Our Washi Tape collection is perfect for adding a quick sentiment to your make! How will you use our new puffy paint range? We can’t wait to see your bright and colourful crafts in the project gallery so remember to upload them and to #Trimcraft when uploading to social media.